H. Rick Bamman - hbamman@shawmedia.com Hometown Electric workers John Nicholes (from left) of Spring Grove , Wendy Longmire of Ingleside, Tye Dupuis of Trever Wis. and Mark "Sparky" Sword, of Wonder Lake install traffic lights on a light standard at the southwest corner of U. S. Rt. 14 and Lucas Rd. H. Rick Bamman - hbamman@shawmedia.com Hometown Electric workers Tye Dupuis (left) of Trever Wis. Wendy Longmire of Ingleside and Mark "Sparky" Sword, of Wonder Lake install traffic lights on a light standard at the southwest corner of U. S. Rt. 14 and Lucas Rd. 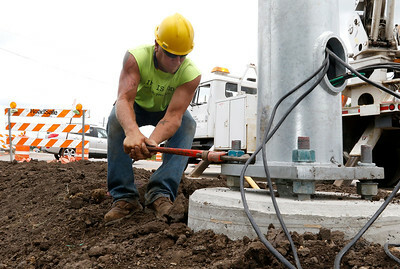 H. Rick Bamman - hbamman@shawmedia.com Hometown Electric worker John Nicholes of Spring Grove secures a traffic light pole to the base at the southwest corner of U. S. Rt. 14 and Lucas Rd.